An article published in the journal “Nature Astronomy” describes the study of a gas outflow from the Small Magellanic Cloud that extends for at least 6,500 light years from its star formation area. A team of researchers used the ASKAP radio telescope to observe that dwarf galaxy in its entirety in a single shot with details never seen before. The conclusion is that there’s a gas loss resulting in a drop in star formation. That gas could be a source for what is known as Magellanic Stream and over time the Small Magellanic Cloud could be devoured by the Milky Way. The Small Magellanic Cloud is one of the Milky Way’s satellite dwarf galaxies. The Magellanic Stream is a huge field of gas clouds that connect the Milky Way to both Magellanic Clouds, since there’s also the Great Cloud. The question of its origin is complex and an article published in the journal “The Astrophysical Journal” described a research on the Leading Arm of the Magellanic Stream as a result of a gravitational clash between the two dwarf galaxies. Now these new observations offer new information on one of the possible sources of gas. 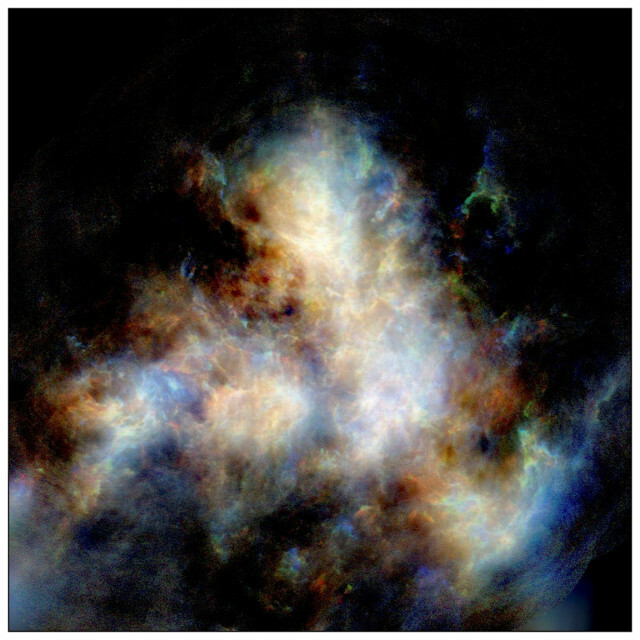 Professor Naomi McClure-Griffiths, an astronomer of the Australian National University (ANU) and first author of this new study, stated that the ASKAP (Australia Square Kilometer Array Pathfinder) radio telescope allowed to obtain images of the Small Magellanic Cloud three times more detailed than the previous ones. This allowed her team to study the interaction between that dwarf galaxy and its environment with greater accuracy. The most important result of this study was the observation of a gas outflow from the Small Magellanic Cloud. It’s atomic hydrogen in an amount estimated around 10 million solar masses, which makes up about 3% of the mass of this dwarf galaxy. It’s a really remarkable amount of gas that’s moving away from it with important consequences on its star formation possibilities. The less gas remains the less chances that new stars will form. When star formation ceases in a galaxy, a long agony begins. The brightest stars are the most massive but also the ones that consume their hydrogen at very high speeds so in a few million years without replacements what are known as blue giants will start disappearing. Things are better for the stars with a mass similar to the Sun’s, which can live for several billions of years, but the end is inevitable. Red dwarfs have a very long life, even trillions of years, so at some point a galaxy that no longer produces stars ends up having a faint reddish light. This study is part of a project that investigates the evolution of galaxies and Professor Naomi McClure-Griffiths stressed its importance because it’s the first time that researchers are able to measure the amount of gas lost by a dwarf galaxy. In this case, it’s even more important because it could be a source of gas for the Magellanic Stream. David McConnell of CSIRO (Commonwealth Scientific and Industrial Research Organization), another of the study’s authors, stressed the importance of the ASKAP radio telescope for this result and the possibility of observing the Small Magellanic Cloud in one shot thanks to the fact that its antennas can offer a panoramic view of the sky. This will allow to continue this type of study on both Magellanic Clouds but also on the hydrogen gas present in the Milky Way to obtain further information on their evolution that will help us to improve our models on the evolution of galaxies in general. This is another excellent result for the ASKAP radio telescope, put into operation in October 2012. It’s a precursor of the SKA radio telescope, which will be activated in a few years and could obtain even more detailed observations of the Magellanic Stream after the integration of the other precursor, the MeerKAT in South Africa.